The Korean homeshare programme started in 2012 as one of several social renovation projects planned by Seoul City. It aims to promote the social welfare of the increasing number of older people combined with the housing problems of young people. The programme operates as a ‘civilian lease housing’ project. The programme matches older home owners with university students from the remote countryside, who have difficulties in finding adequate places to live. Home owners lease their spare rooms to the students at half the market rate and the students provide the old people with some practical services. Older people benefit economically and emotionally while university students get secure, low-cost, good quality housing near their campus. This programme operates under the title of ‘Intergenerational Empathy Under One Roof’ by the Housing Policy Division of Seoul City and is very active among 10 out of 25 Gu-Districts where universities are located. By the end of 2016, 228 matches were reported, supporting people mainly around 70 years old. 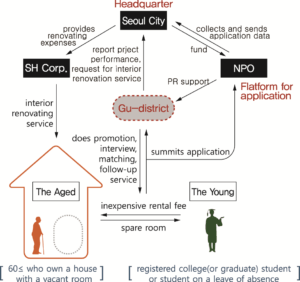 Since student applicants outnumber the homeshare providers, Seoul City is endeavouring to support some house repair costs and advertisements to widen the programme. Besides Seoul City, other metropolitan cities are showing an interest in piloting the project. Distinctively, at present, these projects are operated by local government not by civilian organisations.